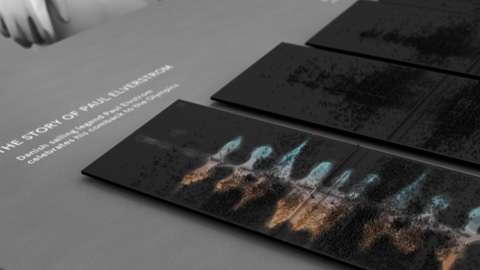 A true mamooth project has finally launched: emoto. 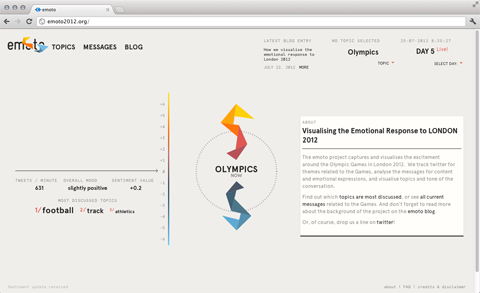 Together with a huge team around Drew Hemment and Studio NAND, and a partnership with MIT Senseable City Lab, we aim at visualising the online reponse to the Olympic Games for the London 2012 Festival and Cultural Olympiad in the Northwest. 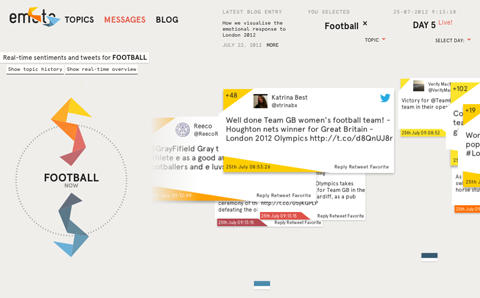 Basically, the idea is to track Twitter messages for content (which topics, disciplines, athletes etc they refer) to and emotional tone (are they cheering, swearing, being indifferent) and make that info available real-time on http://emoto2012.org, as a supplement or even alternative to traditional ways of consuming the Games coverage. Our goal is to reveal both the big picture as well as the little anecdotes that make up the big, big stream of messages. After the games, we will turn the collected tweets into an actual physical object, to archive these ephemeral little “things flying by” forever. And during the games, we are posting insights and in-depth analyses (here is a first post on the Opening Ceremony), so there is also a little data journalistic angle to the whole package. I have to say, this is probably one of the most ambitious projects I have worked on this far, and despite some small rocks encountered along the way, I am really happy how it turned out.. I hope you like it, too!